You can expand your binding punch die sets by finding them on our website and adding them to your cart as well. 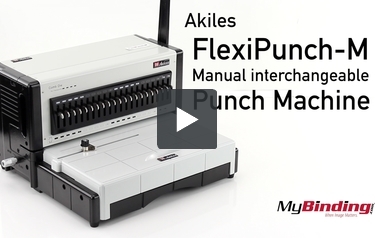 The incredible new Akiles FlexiPunch-M manual interchangeable die binding punch offers the ability to switch punching styles in seconds without the huge price tag that accompanies most other modular binding punches. The new FlexiPunch-M can be used for plastic comb binding, double loop wire binding or for spiral coil binding. This make the FlexiPunch an ideal solution for an office that needs to use multiple binding styles or for an organization that wants the flexibility to change in the future. One die set is included with the FlexiPunch-M and additional dies are available for purchase seperately. Just make sure that you remember to buy a coil inserter, comb opener or wire closer to help finish your bound documents. High Volume Punching Capacity: The heavy duty manual punching mechanism can handle up to 25 sheets of 20lb paper per lift. Interchangeable Die Sets: You can easily change from one punching pattern to another. No tools are required and it only takes seconds to switch patterns. Fully Disengageable Punching Pins: The FlexiPunch-M allows punching of all paper sizes without partially punched holes at either end. Four Available Punching Patterns: Punching patterns are available for comb punching (rectangular holes), 2:1 pitch twin loop wire binding (square holes), 3:1 pitch twin loop wire binding (square holes) and 4:1 Pitch (0.2475") Round Hole Coil Binding. Adjustable Depth of Punch Margin Control: Available for all four punching dies, this feature allows you to adjust the distance of the punched holes from the edge of your document. Twelve Inch Punching Length: The 12" punching length of this document enables easy punching of both letter size or A4 sized documents. You can even punch larger sheet sizes utilizing the open throat design of this machine.. Heavy-Duty All Metal Construction: The FlexiPunch-M features a heavy-duty all metal construction, including heavy cast side plates and non-skid feet. Transcript: This is the Flexipunch-M Manual Interchangeable Punch Machine! First select your punch type and insert the punching mechanism into the front. Make sure it is in all the way, then lock it into place. Next place on the front panel and you are ready to punch! It can punch up to 25 sheets at a time, but I will warn you that it will take quite a bit of effort. We recommend punching a little less for me ease of use. All the punching units have adjustable die pins so your holes are evenly placed for any sized project. This is the Flexipunch-M Manual Interchangeable Punch Machine! The side margin control moves from side to side for making adjustments for paper size. And adjusting the depth margin increases and decreases the margin between the hole and the edge of your page going length wise. Remove the tray below to empty the trimmings in a recycle bin. There are 4 die pieces to choose from for your different binding needs. Aiming to compete in the manual modular binding punch market, especially in the ease of use, rugged construction, and low price categories, the FlexiPunch M provides a nice choice for organizations who want some variety on their binding options without breaking the bank. We peeked under the hood of this machine, and put together a list of what we saw as some of its strengths and weaknesses. The chief strength of the FlexiPunch M is that it gives you so many options for punching and binding at such a low price point. With this one machine, you can punch holes for comb binding, twin loop binding in both 2:1 and 3:1 pitches (square holes), and 4:1 round hole wire coil binding. There are a lot of machines out there that give you similar options, but to have this many options at such a low price is somewhat of a rarity. The sheet punching capacity of the FlexiPunch M is really pretty impressive at up to 25 sheets of 20lb paper per lift. For a manual machine, it seemed to us that the lever was pretty powerful and easy to use as well. The FlexiPunch M features an open throat design as well as fully disengageable punching pins, which means that using this machine you will be able to punch just about any size document, using a two punch process for documents that are longer than 12 inches. As we have said, there are a lot of modular binding punches on the market with similar capabilities to the FlexiPunch M. One great way in which the FlexiPunch M has distinguished itself is in the ease of use category. Changing dies on this machine could not be a simpler process, and in most cases takes just a matter of seconds, even for the most technically challenged among us. No tools are required to make the switch, and the dies (one of which is included in your purchase, the others of which must be ordered separately) sit together nicely on a shelf, so you can just grab the one you want, and off you go. As with all of Akiles' machines, the FlexiPunch M is a rugged, all metal beast that appears to be ready to give you years of faithful service. Though the FlexiPunch M is a really nice manual punch, it is just a manual punch after all. What this means is that for really high-volume production environments, it may be a little slow and tedious to use. If you are going to need to produce hundreds of documents a week or so, you will likely want to consider purchasing an electric punch such as the Akiles FlexiPunch E in order to save you a lot of time and effort (of not necessarily money). The FlexiPunch M does not come with any sort of finishing equipment (such as a coil inserter, comb opener, or wire closer). That should not be any sort of deal breaker, but you will need to be aware that when you purchase this machine, you will have to make sure that you also find and purchase the correct finishing equipment for the kinds of jobs you intend to do.